As a guest at Historic Manta House, you can choose from a 1, 2, or 3 bedroom private, self-contained bungalow or any combination of the above for groups, parties, or weddings. 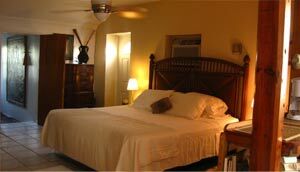 Historic Manta House bungalows offer accommodations larger than hotel room with full kitchens and plenty of living space. The water is turquoise......and as clean as the dawn of creation. Approaching from the air, you will notice the unbelievable contrasting colours of emerald islands outlined with powdery white sand and an infinite spectrum of ocean blues. From picture windows, see the dazzling sand and the sparkling ocean. At evening tide, see gorgeous sunsets that will blow your mind. As a guest at Historic Manta House, your slightest wish or request will receive prompt and friendly service. Attention to detail and the unique surroundings make this the most inviting Grand Turk accommodation you will find, and it's affordable too! 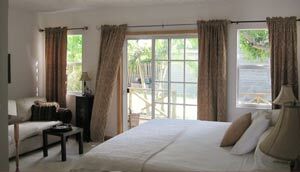 The Jungle Bungalow is a stunning, roomy, sun-filled, 1 bedroom suite with African accents. Enjoy all the modern updates of a full kitchen and en suite bathroom with your own private patio featuring sunset views over the ocean. 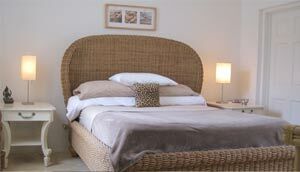 The Middle Bungalow is a self-contained 3 bedroom beach bungalow with a fully equipped kitchen and comfy living room. This property boasts a large private deck, full en suite bathroom, and cathedral ceilings. The North Bungalow is a large, bright, 2 bedroom, 2 bathroom beach house that boasts a full kitchen, living room/dining room, central AC, flat screen TV, and 2 private patios; one overlooking the ocean and one in your own private garden.